As one of the world’s major metropolises, Los Angeles needs a world-class airport, one that reflects the character and class of this great city. 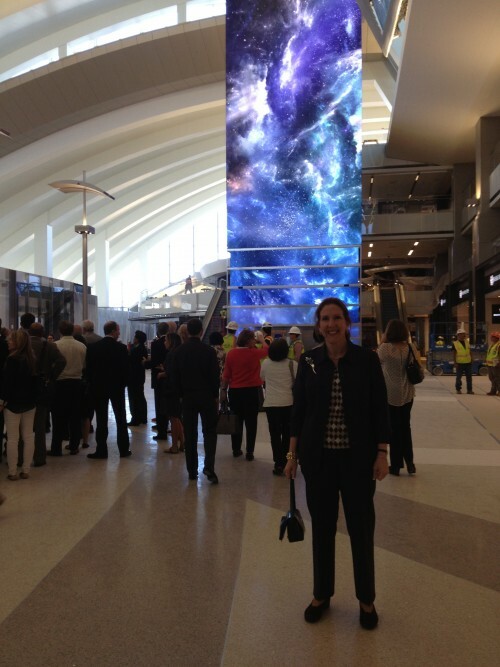 Recently, I had the opportunity to tour the newly revamped Bradley West International Terminal at the Los Angeles International Airport (LAX) at an event hosted by the Urban Land Institute (ULI). The afternoon began with lunch at the Proud Bird restaurant, where guests were given an overview of the airport’s expansion plans and what the terminal’s architects and designers hoped to achieve. The team behind the terminal sought to create an airport that truly reflects the essence of Los Angeles – a goal that is immediately apparent before a traveler even sets foot inside the terminal. The building features enormous screens, several stories tall, that display rotating scenes from LA as well as interesting visual touches such as huge piles of old-fashioned luggage towering toward the sky. The terminal will also feature a “prestige island” comprising upscale and designer stores, like Bulgari, and unique local restaurants, such as Umami Burger, rather than standard airport fare like fast food restaurants and newsstands. Entering the country will be easier for international visitors due to a streamlined passport and immigration process. Viewed from the outside, the building evokes the ocean with an elegantly undulating shape, reminiscent of waves crashing over one another. Inside, the building is light and airy, helping to create an outstanding first impression on people arriving at the airport. With the new Bradley West International Terminal set to open in September, it looks as though Los Angeles finally has the airport it deserves.